All you need is one CigoQuit-1 kit, and you are smoke-free! 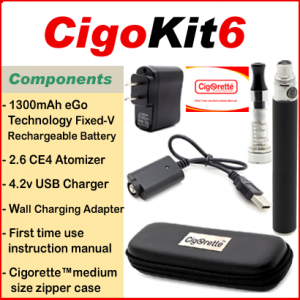 CigoQuit-1 TM Kit is designed to help smokers in quitting Tobacco smoking and nicotine addiction by smooth bridging from 1.8% (18mg/ml) concentration of daily consumed nicotine down to zero over a two month period of a 100% satisfying vaping with a zero% craving to Tobacco cigarette. (in a nutshell, it will flush the nicotine -gradually- from the body/system). Moreover, It imitates the act of smoking as an added value to the success of the quitting process with no tobacco, no tar, no ash, no toxins, and no smoke smell. 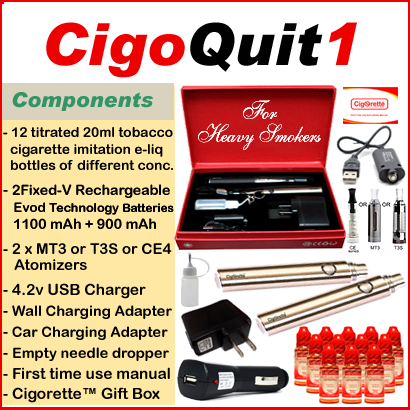 CigoQuit1 (quit smoking aid kit) for the use of heavy smokers contains twelve titrated tobacco e-liquid bottles -flavour only-of 20ml size each. These 12 bottles are of a unique, satisfying tobacco flavour that is confined to CigoQuit brand. And of different strengths and concentrations for specific time-framed consumption order. 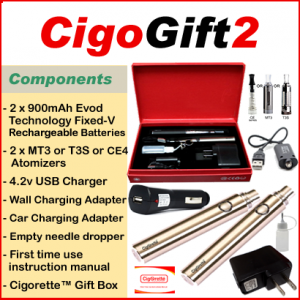 In addition to e-liquids, CigoQuit1 contains two fixed voltage 1100 mAh and 900 mAh Evod technology batteries. 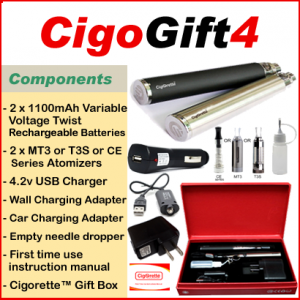 Additionally, two atomizers of 2.6-ohm resistance and USB charger are included. Also, there is a wall charging adapter, car charging adapter. Empty stainless needle dropper, and first-time use instruction manual. 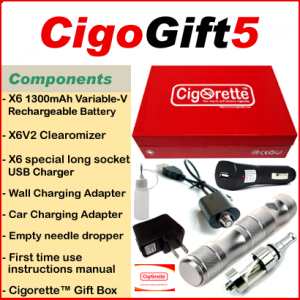 CigoQuit1 is available in Cigorette™ Gift box. - You are smoke-free from day-1. - You are Nicotine-free after 60 days. - You will get complete two month supply of CigoQuit titrated pharma-grade e-Liquid. 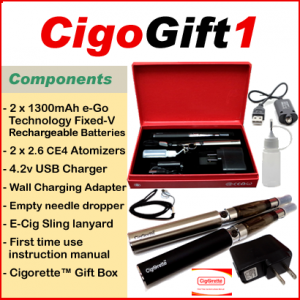 - You will get two quality controlled and assured CigoQuit devices with all related accessories. Limited Time Offer ..... You better act fast! - You are entitled to free expedited and tracked shipping. 1- live-in or visiting the Greater Toronto Area. 2- have easy access to our location at 714 Lakeshore Mississauga. 3- have chosen the "local pickup" shipping option in your shopping cart. If you meet the above 3 criteria, and your local pickup order is received. We'll call you within 24 hours to book you and confirm your session that will get all your questions answered! 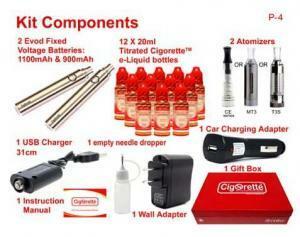 CigoQuit1 smart kit contains twelve titrated cured tobacco – flavour only – eliquid bottles of 20ml size each. These 12 bottles are of a unique satisfying tobacco flavour that is confined -only- to CigoQuit brand. And, of different strengths and concentrations. Each eliquid bottle is unique and for specific time-framed consumption order. 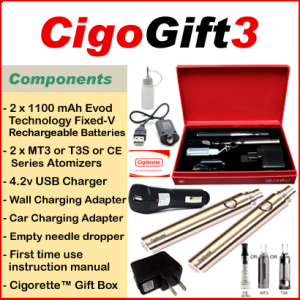 In addition to e-liquids, CigoQuit1 contains two fixed voltage 1100 mAh and 900 mAh Evod technology batteries. Additionally, two atomizers of 2.6-ohm resistance and USB charger. Also, there is a wall charging adapter, car charging adapter. Empty stainless needle dropper, and first-time use instruction manual. 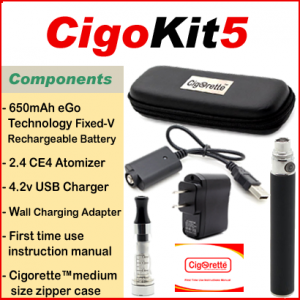 Each battery in this kit features a five click on and off power control button and has a 510 threading connector that makes it compatible with CE4, CE5, CE6, Vivi Nova, Mt3, T3S, T3D, DCT and tens of other atomizers` brands. The batteries contained in this kit have an estimated charging time of 2.5 to 3.5 hours each. Moreover, the 900mAh gives the user around 1000 puffs, and the 1100mAh is almost 1200 after a full charge. Finally, Each battery has nearly 350 to 400 times charging lifespan. Out of a considerable number of testimonials and experiences; CigoQuit is the best, efficient, and cost-effective quit smoking aid kit. And is a great helper for both heavy and regular smokers in quitting nicotine addiction and tobacco cigarettes. That is by smooth and swift bridging from a slightly upper medium concentration of daily consumed nicotine down to zero nicotine state. Additionally, the exact imitation of the act of smoking is an added value to the success of the quitting process. Complete Supply of e-Liquid until you quit! Each liquid bottle included in the CigoQuit1 kit has a number to follow strictly in the order of consumption from 1 to 12. And, each bottle should be enough for a complete 6-7 days which means; CigoQuit1 supply of e-liquid is enough for a period from 72 to 84 days providing not to exceed two full 1.6ml tanks a day. It is worth mentioning that the first bottle has a nicotine concentration of 18mg/ml (1.8%) and is going down to 0mg/ml (0%) nicotine in the last bottle designated as #12. Hey Buddy!, I found this information for you: "CigoQuit1". 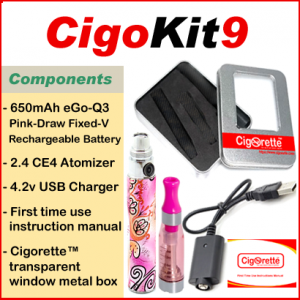 Here is the website link: //www.cigorette.com/shop/kits/cigoquit/cigoquit1/. Thank you.